Hey there! 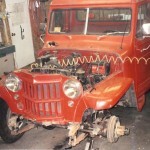 Welcome again to MyClassicJeep.com. This post is intended to be the first of many to come, hopefully, in which I will highlight the story of the build-up of an exceptional classic Jeep. I’ll start with my own story and build off that foundation with engaging stories of classic Jeep vehicles and experiences shared by Jeeper friends here in southwest Ohio, as well as from future readers both near and far. 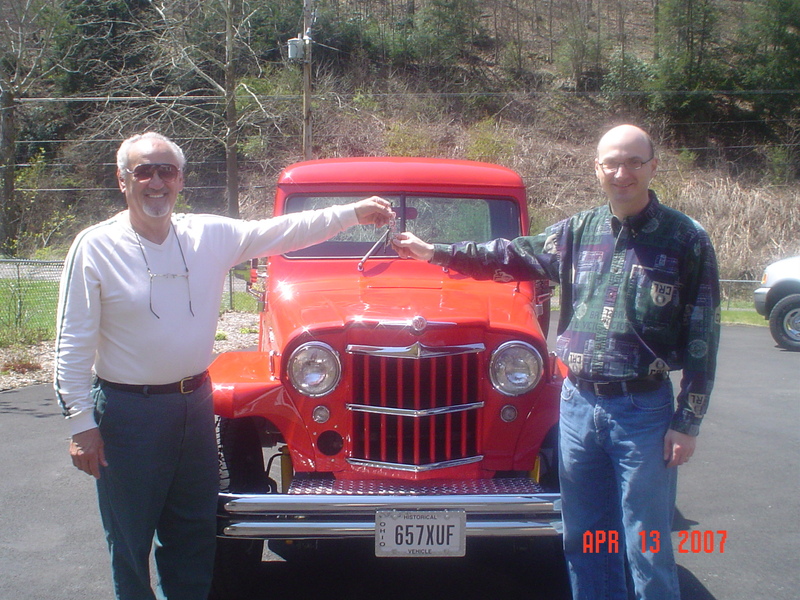 My Jeep story begins with a true love of cars and trucks instilled and encouraged in me by my father Cubert Coleman of Hurley, Virginia. Dad has always been a fan of classic cars and trucks, skewed mostly toward 1930s and ‘40s streetrods and 1950s customs (his current ride is a custom 1953 Studebaker pickup truck). 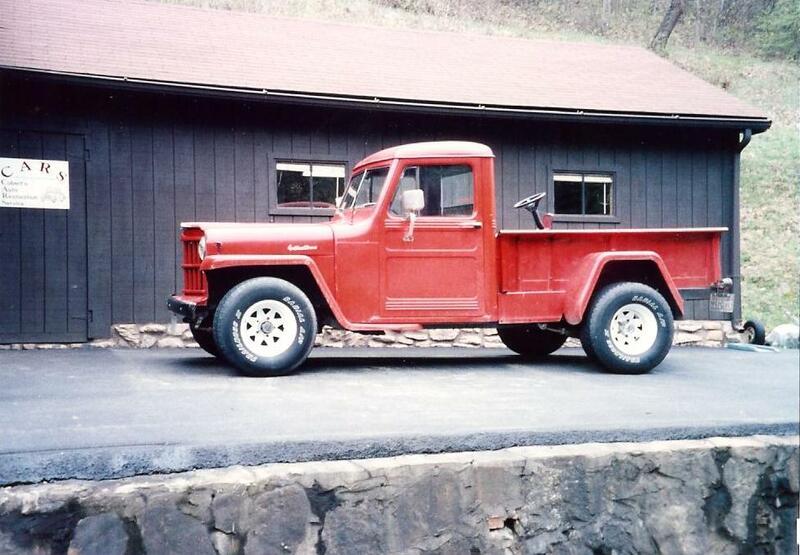 I didn’t have a love of Jeeps, specifically, at the genesis of my automotive passion, but that all changed around 1997 when Dad traded up a red 1960 Willys pickup truck in nearly original, un-restored condition with around 83,000 miles on the odometer. I still remember the telephone conversation when Mom called from Virginia and told me Dad had bought the truck. From my home in Ohio, I could not picture what the vehicle looked like, never having seen one. All I knew for sure was that it would definitely be square and boxy in true Jeep fashion. It turned out, of course, that my expectations were fully met when I went down home for a visit and first saw the truck. 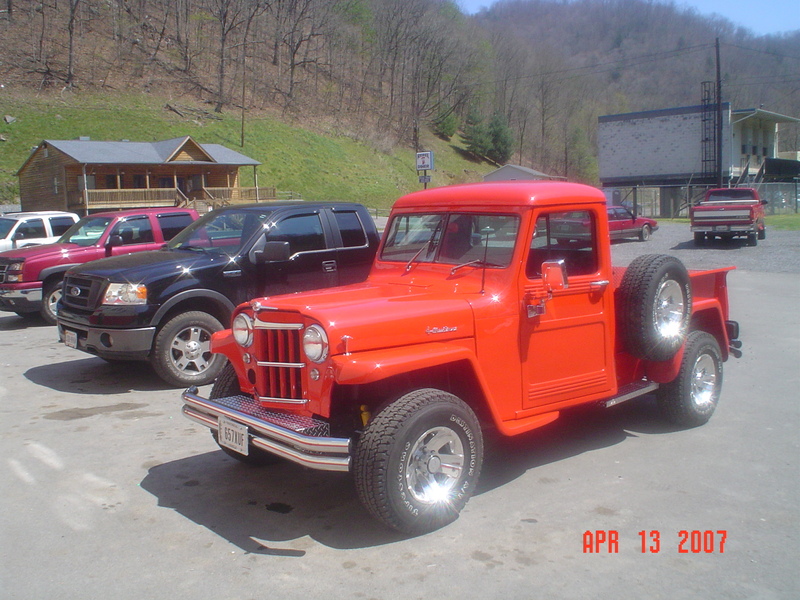 I was immediately wowed by its old-school Jeep style and the elegance of its simplicity. In a later conversation I strongly encouraged Dad not to sell or trade the vehicle, as frequent trading of toy vehicles was his custom, since I thought it was so utterly cool. 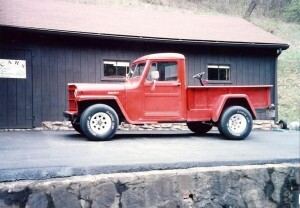 It was around 1998 that Dad, sensing my affinity for the ’60 Willys, called up and offered to give me the vehicle as an early grad school present. He offered to give me the truck and do the restoration/repower conversion work if I would buy parts. I immediately accepted with great enthusiasm and anticipation for what I was sure would be a one-of-a-kind Jeep truck. Little did I know it would be many years hence before both the truck was finished and I was out of grad school! [Grad school seemed like an eternity.] 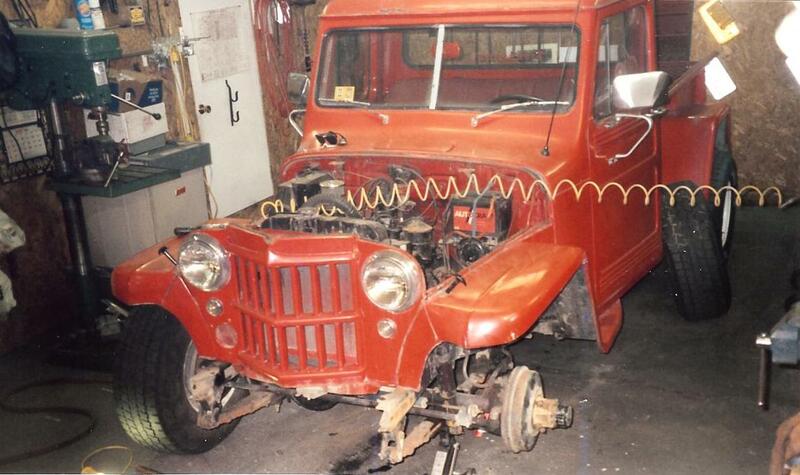 It would be around 9 years before my classic Jeep truck would grace the spot I reserved for it in my garage! 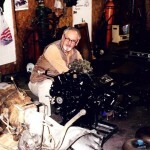 With the internet growing in its usefulness and accessibility during the 1990s, I did some research and found out about Mr. Paul Barry’s Willys parts business at Willys America in California. I ordered Mr. Barry’s repower conversion guide and parts catalog for the upcoming Jeep build. 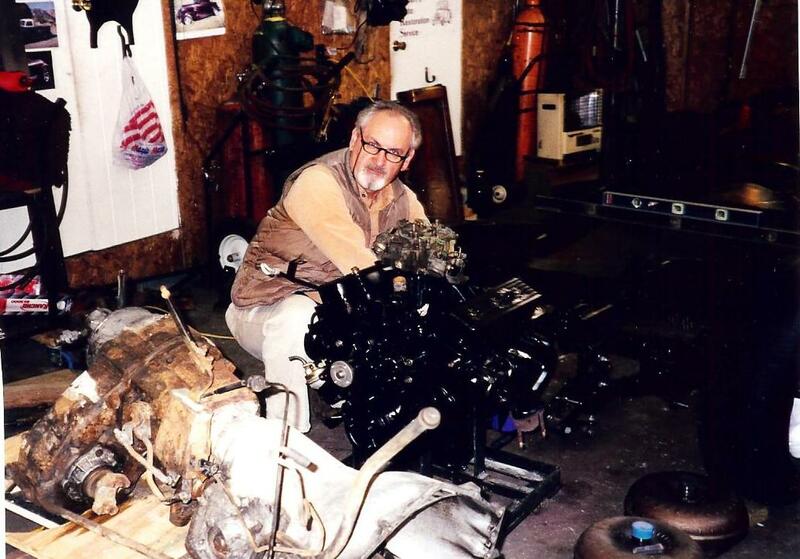 In March 1999, Dad began the disassembly of the pickup for a frame-off repower conversion/renovation. During this timeframe Dad and I poured over the plentiful bits of valuable advice in the Willys America repower conversion guide and selected the AMC Grand Wagoneer front end/Chevy truck/blazer rear end configuration that Mr. Barry recommended as one option for updating the old Willys drivetrain and suspension. Around October 2000, Dad acquired a 1978 Jeep Grand Wagoneer from which the front axle and the steering column was used for the restoration. Around the same timeframe he also procured a rear axle from a 1975 Chevy 4WD pickup truck. He also acquired a 1979 Chevy 350 turbo automatic transmission for the build to mate up with an intended GM power plant [Dad had a 305 V-8 we considered, but ended up obtaining a 4.3 GM V-6 for the build]. 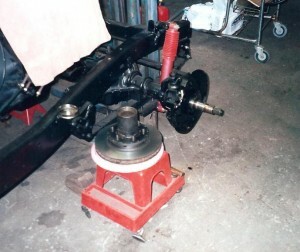 In April 2001, the truck’s bare frame, as well as the front and rear axles were media blasted and painted a nice shiny black. In May of the same year Dad mounted the motor to the finished frame. 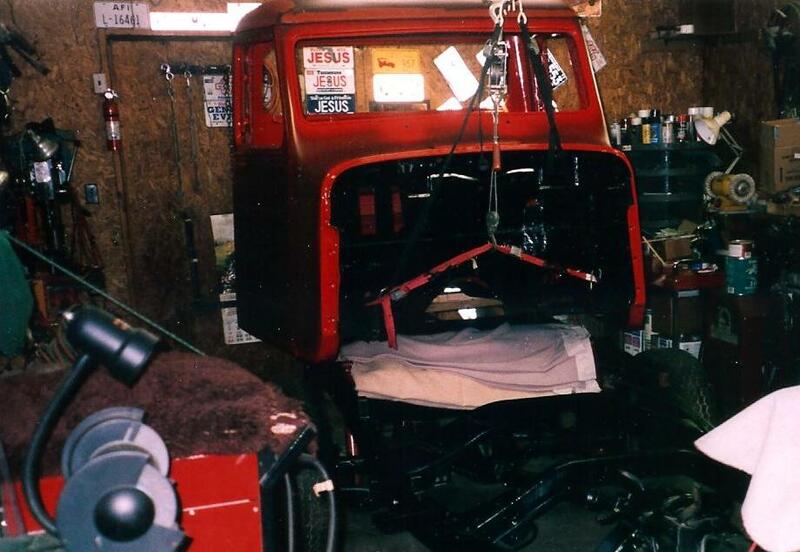 Since the truck was a labor of love that Dad was doing for me amidst his obligatory retirement related piddling and honey-do projects to keep Mom happy, there were often extended periods of inactivity in the Willys build. It would be winter 2002 before any more significant work was done on the truck. 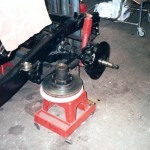 In February 2002 Dad restored the front disc and rear drum brakes. After another long lull, in August 2003 Dad and my brother-in-law Anthony Clifton sanded / ground the cab bottom for patching and painting. Later in the fall/winter of 2005 much body work was done on the truck’s cab. 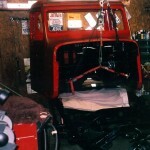 Dad temporarily mounted the reworked cab to the shiny restored frame in December 2003. In January 2004 Dad installed the power brake booster and pedal assembly. Later that winter and on into spring Dad installed the tilt steering column from the donor Grand Wagoneer. He also performed herculean feats in working the puzzle of the wiring and electric power windows. 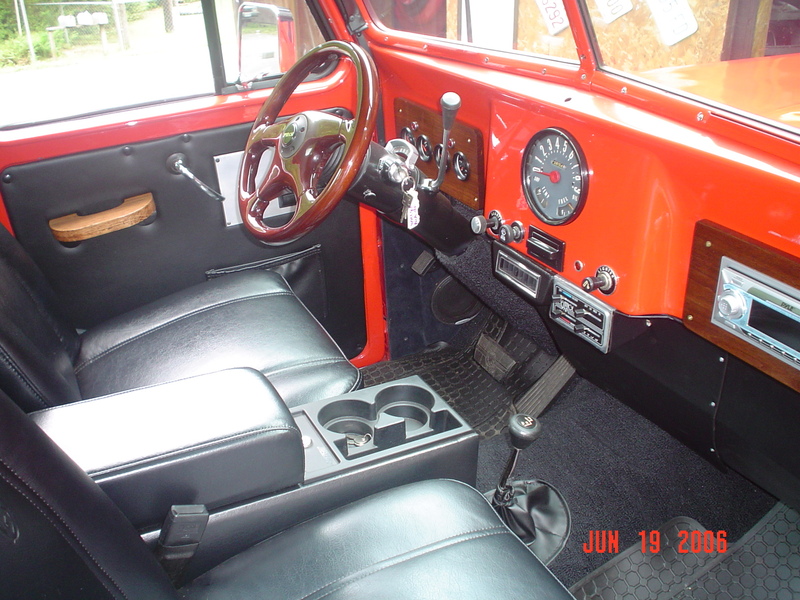 Yes, I said electric power windows – in a 1960 Willys pickup! They were Dad’s idea. I would have been pleased as punch with old-school cranks, but Dad wanted to get all high-tech redneck on me! Thanks, Dad, they’re awesome! Toward the end of 2004 on into 2005, Dad repaired and mounted the front fenders. For those in the know, there is no source for aftermarket replacements for Willys truck/wagon front fenders. As such, Dad had to put some serious work into getting the ones we had up to snuff, with the best pair selected from among several different donor vehicles. In February 2005 Dad installed my seats. I selected and purchased the Bestop low-back vinyl bucket seats and a matching lockable floor console. About a month later, Dad mounted the grille, installed the fan shroud, and mounted the hood. It turned out to be a pretty busy year for Dad and the truck in 2005. 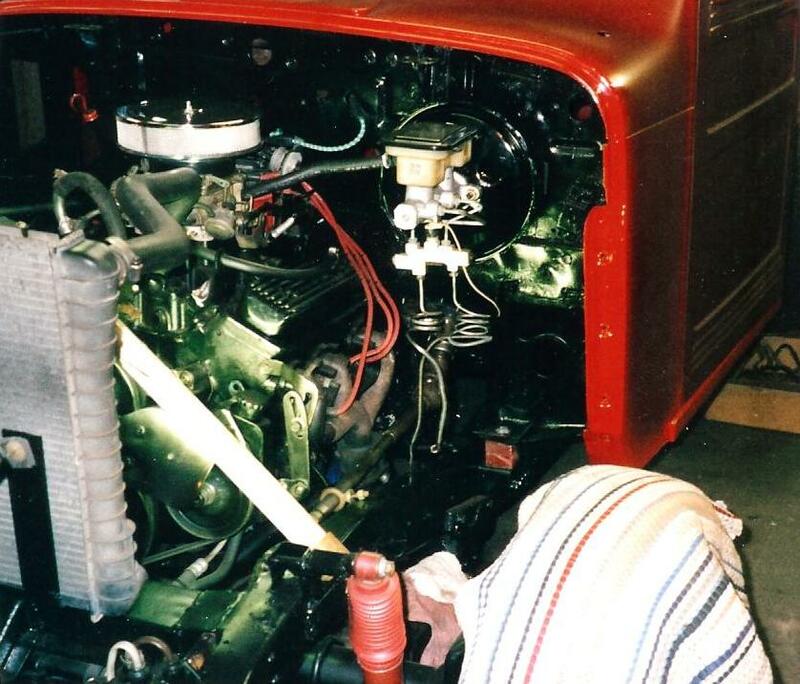 In July he installed sound/heat insulation in the cab and completed the vehicle’s wiring. In September Dad installed custom wooden dash panels. Dad and our cousin and long-time neighbor Don Lester crafted the custom panels and did a beautiful job. The panels were mounted with a custom gage package and a Pyle stereo CD/cassette. The front fenders were also painted during this timeframe. The cab paint was completed in December. During the period of July through December 2006 the bed, again selected from one of several donor trucks since it was way better than the original bed on my truck, was deconstructed. The bed walls were removed from the standards, requiring Dad to drill out a seemingly countless number of spot welds. The bed frame was stripped and painted, new bed walls were fabricated and subsequently welded to the bed frame. Fiberglass rear fenders sourced from Willys America were installed, and the bed and fenders were painted to match the cab. 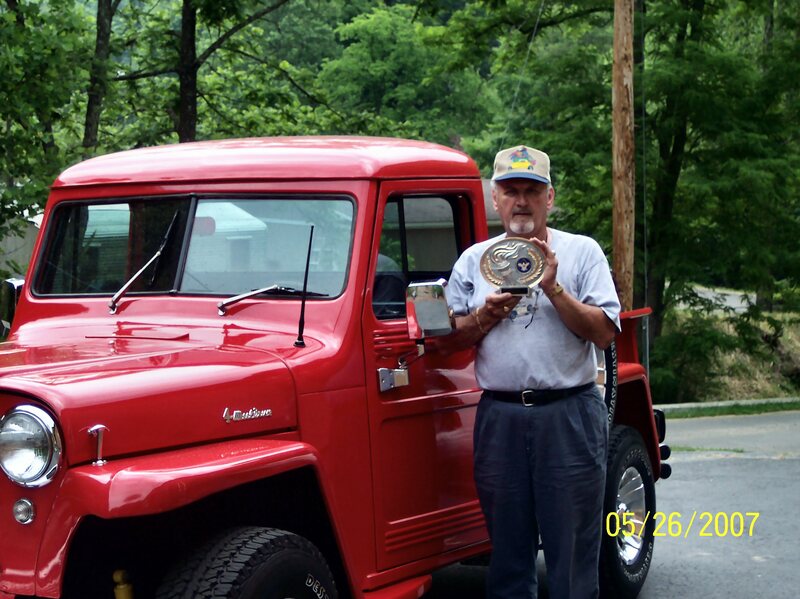 Pop wins the truck's first trophy! During the winter of 2006/2007 final assembly began on the truck. Dad fabricated a custom tailgate with outer and inner (diamond plate aluminum) skin, and installed a bed floor also composed of aluminum diamond plate. Dad also fabricated and installed custom aluminum diamond plate side steps on the bed. Final assembly was complete in May. 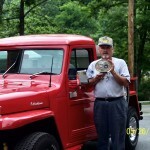 On May 26, 2007, Dad won the truck’s first trophy at a small car show in Grundy, VA. Interestingly, the car show was sponsored by Modern Sales, the very Jeep dealership (now defunct, but originally one of the oldest Jeep dealerships in the U.S.) from which the truck was originally purchased in 1960 or 1961. 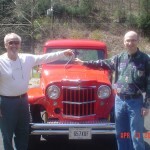 After 9 years since the promise of the truck, in July 2007 Dad and Mom made the fateful journey from Virginia to Ohio with my big red toy. Words fail to describe my feelings when seeing my parents pull into our subdivision with the finished vehicle on the back of a flatbed trailer. 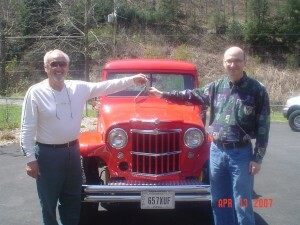 Ever since then I have been the proud owner of an eye-popping red 1960 Willys pickup truck that occupies a prominent place in my third car garage. I suppose this is as good a place as any to offer my thanks to Dad for all his hard work, as well as to my wife Amy for supporting me in allowing withdrawals from the general fund for use on my beloved Jeep. I also need to thank my mom for enduring Dad’s distractions from honey-do projects during the build. As stated previously, my story is intended as the first in a perpetual series of stories on the acquisition and/or build-up of classic Jeep vehicles from Jeeper friends known and yet unknown. 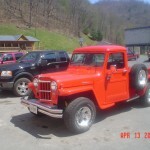 If you have a classic Jeep (pre-CJ through XJ Cherokee, but not including TJ Wranglers and newer) that you think would make a good candidate for a MyClassicJeep.com story, give me a yell at MyClassicJeep@gmail.com. Willys Pickup Gets Nominated for the NY Times 2010 Collectible Car of the Year! 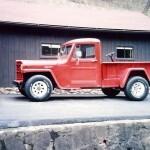 Jeep Concept Truck Hotness: The Jeep Nukizer 715! Beautiful, truck. 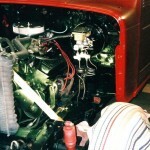 I am just starting on a 1956 truck. 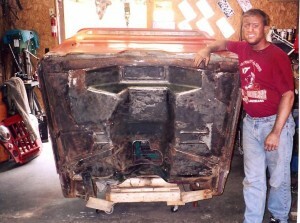 I plan to set the body on a ford ranger frame to be a daily driver, and I need 60 plus mph. 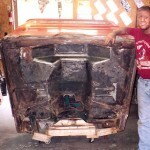 I am currently doing a frame off build of a 50 willys truck. I have built a 64 327 engine, with a 5 speed trans. ford 9 inch. I am working on the front end. i want to install an IFS front end. 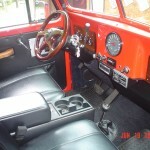 I have some questions for you about the interior setup on the 61 truck. i would appreciate any help in talking to the owner of that truck. That is a very nice truck. I have a 1959 jeep Willys pick-up and really want to install the Bestop low-back vinyl bucket seats. Does Bestop sell a mounting kit or did you fabricate the mount? Any help would be appreciated.